Mold can grow on nearly any and every surface in your Palmyra, NJ home. In the right conditions and given the opportunity, mold can thrive and wreak havoc on your home. Seemingly minor mold growth can be worse than it appears, and it can quickly develop into a serious and expensive contamination. Neglected mold growth could be leaving you, your family, and your home vulnerable to the dangerous side effects of mold. Mold can release mycotoxins that are potentially toxic to you and your family. The water damage stimulating the mold growth will diminish the structural integrity of your home. Mold should be addressed promptly and properly by a certified mold professional in New Jersey. If you suspect that your Palmyra, NJ home is at risk of a mold contamination, you need to consider contacting a certified mold professional to conduct a mold inspection in Palmyra, NJ. 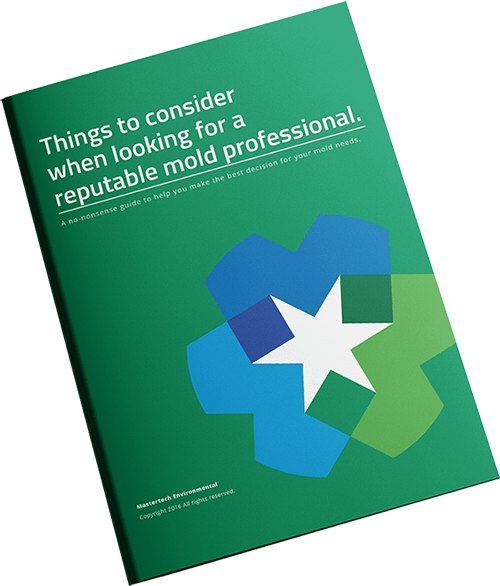 Mold is a bio-contaminant that should be handled by a certified professional who will have the necessary skills, training, and tools to safely assess the full extent of the problem. A MasterTech mold inspection will be able to determine if a mold problem exists, what caused the problem, how bad is the problem, and properly remove the mold. MasterTech inspectors are thoroughly certified and trained in the safest and mold advance mold removal tools and technologies. Through the use of moisture meters, thermal imaging readers, and mold testing, our inspector will be able to safely diagnose your mold problem and prescribe an appropriate mold remediation plan. MasterTech always has you and your family’s safety and best interest in mind. Our team is committed to providing the safest and most effective mold remediation in Palmyra, NJ. We have made every effort to strategically integrate the safest and most up-to-date mold removal tools, techniques, and research into the development of our step-by-step mold removal and remediation process. Containment: Place barriers around all areas of remediation to prevent cross-contamination. Cover & Protect: Floors and belongings will be covered and protected for the remediation process. Air Filtration: HEPA-filtered air filtration devices maintain safe and clean indoor air quality. HEPA Vacuum: HEPA-vacuums are used to remove all surface mold spores from building materials. Demolition & Removal: Non-salvageable building materials will be carefully removed and disposed. Antimicrobial Application: An antimicrobial agent will be applied to destroy mold growth at the surface. Embedded Mold Removal: A concentrated hydrogen peroxide agent will remove all mold roots. Scrub & Wipe Clean: All surfaces are scrubbed and wiped clean. Re-HEPA Vacuum: HEPA-vacuum again to ensure that any remaining mold spores are removed. Mold-Proof Coating: A mold-resistant coating is applied to cleaned surfaces to help prevent recurrence. Confirm Cleanup: A post remediation inspection will be completed to confirm a successful cleanup. The MasterTech standard for all mold remediation is getting the job done right the first time. Because, when it comes to mold, a bad remediation can mean health implications for you and your family and property damage to your Palmyra, NJ home. That is why every MasterTech mold removal in Palmyra, NJ is backed by a 5-year mold-free warranty. It is our promise that the mold has been properly removed, and it will not grow back. Sometimes, humidity, condensation and poor air circulation will provide an adequate water sources for mold development. The water problem will not always be as obvious as a major leak or flood. Basement foundation walls are mostly underground and are prone to seepage or leakage through tiny pores and cracks, which can easily go unnoticed if you do not know to be aware of it. The first sign of water intrusion is usually water staining or efflorescence. Efflorescence is the white, powdery substance that develops on the foundation wall surface. It is the result of water or vapor seepage which forces soluble salts and minerals to the surface. While efflorescence is not mold, but it is a sign of water or moisture seepage which can cause mold. If you are detecting signs of mold growth or if your Palmyra, NJ basement has a history of moisture problems, you should contact a certified basement mold professional in Palmyra, NJ. Most crawl spaces contain perfect conditions to support mold growth. Porous building materials and poor building envelope design play a huge role in most crawl space mold in Palmyra, NJ. Many crawl spaces are poorly vented with undersized wall vents. Although this seemed like a great idea years ago when they were introduced and added to the construction code, they have made moisture and mold issues worse. In spring and summer, crawl space vents introduce warm air into cool crawl spaces causing condensation on wood and masonry building materials. The same effect happens during cold seasons – only in the opposite order. The combination of heat and poor ventilation can cause Palmyra, NJ attic mold. If not properly ventilated, moist air gets trapped and infuses itself into the attic sheathing and rafters. This moist air can also increase airborne mold spore levels which can settle into insulation and on belongings stored in your attic. Proper mold remediation techniques are important to ensure that attic mold doesn’t cross-contaminate the inhabitable areas below during cleanup. Our process also minimizes or eliminates dark staining left behind by moisture. Most mold contamination in interior spaces is caused by water leaks, flooring or broken pipes. But humidity alone can cause mold to develop in an interior space with poor air circulation or a lack of air conditioning. If you suspect mold in your home or business, don’t wait to have it checked. Depending on the degree of contamination, your mold problem may require an invasive or non-invasive approach. Invasive involves the removal of building materials like drywall, insulation or carpeting. Non-invasive mold remediation involves cleaning building materials as opposed to removing them. In most cases, if drywall, insulation or carpeting is affected by mold, it has to be removed and replaced. Do not neglect mold development in your New Jersey property and put your family at risk. Upon discovering signs of a mold contamination, call MasterTech to learn more about mold removal in Burlington County, NJ. If you are in need of mold inspection and mold removal in Delanco, NJ or mold inspection and mold removal in Edgewater Park, NJ, the Mastertech Team can help! Contact us today to speak with a specialist 1-800-310-3226. Or fill out the form below and a team member will be in touch with you shortly. I have used Mastertech's services on three different projects on two houses in the past year and would recommend them to anyone. They are caring, professional people who have always been accessible to answer any concerns. They make sure you understand anything that's not clear to you. Well done Mastertech! Very professional. Work was to take 5 days, the crew got in done in 4. Excellent work. Very pleased with the outcome of the basement.